Most of the pickups on my Rhodes are not working. From the bottom key of my 88 to key 14 (Bb0) is OK when tapped with a screwdriver. 15 is very faint, 16 does not work, and none of the pickups work past that until I get to key 76, which is where the pickups split to a second wire. I assumed that one or more of my pickup wires were broken, but everything seems correct. They are wired correctly according to the Rhodes spec. When I measure them with an Ohm meter, that seems correct too. In the diagram below, the top shows the resistance in the wiring breaks. 186 ohms between 12-13 top break, 173 ohms between 14-15 bottom, 156 ohms between 16-17 top. Between those other stages is 0-1 ohms resistance. Any clues? Thank you for your time. Does the '78 the dreaded "white tape" pickups? I don't think so, but they are notorious for quitting on the job. No, mine looks almost identical to the ones that VV sells. I've brushed the rust off of them since this picture was taken, and did the copper foil mod. Was this a recent purchase, or have you had this piano for awhile? Did the pickups all recently go out? I mean, were they working one day and then suddenly all stopped? I'm not sure what is being measuring between the breaks, but on mine I get around 120 ohm across the rail. I get 60 ohm across the groups of 3. Have you measured the resistance of any of the "Dead" pickups? You are measuring the resistance in a funny place. 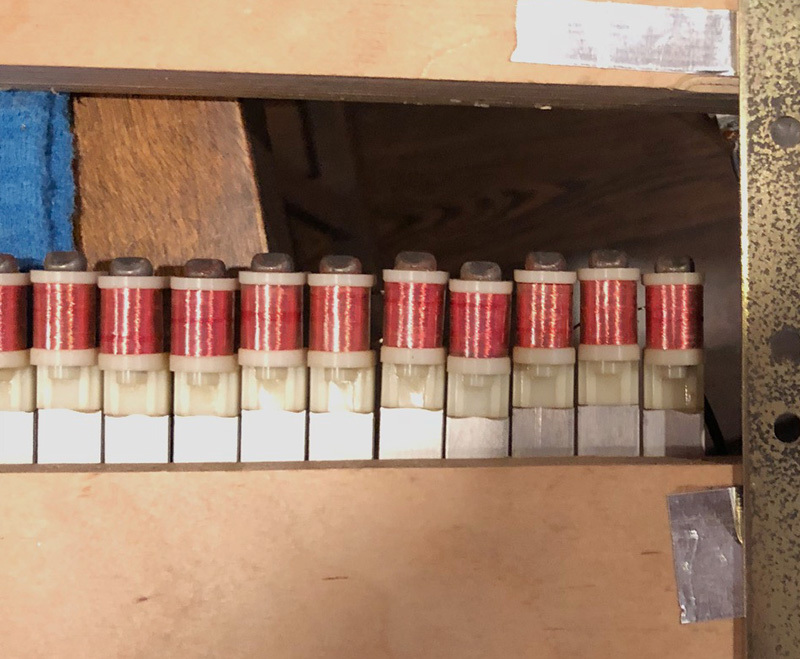 If you are measuring the resistance at the wiring gaps between the front terminals on neighboring pickups, you will get something close to 180Ω if all four of the neighboring pickups are functional. Normally, I would expect you to put your meter between the front and back terminals on the same pickup. In a group-of-two, you would get about 90Ω if both pickups are working, 180Ω if one pickup is dead. In a group-of-three, you should get about 60Ω if all three pickups are working, 90Ω if two pickups are working, 180Ω if only one pickup is working. I am intrigued to figure out what portion of the pickup wiring you say reads only zero or 1Ω. Did you mean simply between terminals that are connected together with the bus wire (which would be obviously just right), or did you mean that you get the whole middle section is shorted out? The only time I have seen large sections shorted out is when I accidentally have a tonebar touching a pickup terminal, but your photo shows the tone bars removed. Can we get a more detailed description of what is going on, and maybe a photo of the top side of the pickups? I assume that when you say 0-1 ohms, you mean between zero and one, right? Some meters show "O-L" to mean overload, open circuit, or infinite resistance. That was an old photo, the tonebars are now reinstalled in the piano. I can take a photo if that helps, maybe if you tell me what you're looking for I can take a better one. I will try measuring the resistance from top to bottom on the pickups. I forgot to mention that measuring resistance from one end of the pickups to the other also shows that they are connected. I assumed there must be a break in there somewhere, but I can measure from the first pickup to the black wire on top and it was showing a signal. (I can't remember right now but I think under 300 ohms.) I thought I would just find the break that way but it appears to be connected together. And I assumed that a bad pickup wouldn't take out the whole piano because they're not wired in series? I was also thinking that a jumper cable to the capacitor at the high end of the piano to the lower pickups might help me track down where it's broken. 15 (B0) is a bit low but it doesn't seem like it should take out all of the other pickups. When I play 16 (C1), I hear a click/glitch every time. And when I hit the magnet with a screwdriver now, I hear the same glitchy click. But 15 and 17 do not make a noise when I hit them with a screwdriver, and 17-75 do not make a sound. I hope this is an aha moment for someone because I am stuck. I'm ready to just touch up every solder joint in that range. Here is a video of the "glitchy key:"
Keys above that one do not sound. Is that pickup dead? I think the tonebar that is just to the right of the missing three tines is touching the rear solder terminal on the pickup below it. Yeah, that was it! Thank you. Page created in 0.197 seconds with 35 queries.